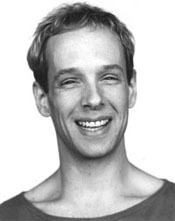 Christopher Caines was born in Halifax, Nova Scotia, Canada, and trained principally with Claire Mallardi, Hanya Holm, Mary Anthony, at the Merce Cunningham Studio (modern), and with Marie Pacquette and Nenette Charisse (ballet). His musical studies include tabla, frame drumming, and both Western and Indian classical singing. Early in his career, he danced for about 25 New York?based choreographers, and also worked as an actor, director, lighting designer, singer, drummer, and composer for dance and theater. Caines began to make his own work in 1990; his early pieces included dances, site-specific pieces, and interdisciplinary multimedia performance works. He founded the Christopher Caines Dance Company in 2000, and has since made some 20 dances for the company. He is noted for his musicality and musicianship; he has been called "the most musically sophisticated choreographer under 45 in the United States." (Mindy Aloff, Dance View Times). His commissions for groups of student dancers and musicians include dances created as the Ruth Page Visiting Guest Artist in Dance at Harvard University (1999) and as a visiting faculty member at Princeton University and Swarthmore College (2001?02). In 2003 Caines made his first film choreography, for Basque director Arkaitz Bastera Zalbide; and in 2005 his first dances for theater, choreographing Romeo and Juliet in Renaissance period style for the Actors Shakespeare Company of New Jersey. Caines was a special researcher for the Balanchine Foundation's Popular Balanchine project (2001?03), and his essays have appeared in the International Encyclopedia of Dance (Oxford University Press, 1997), for which he also served as assistant project editor; the International Dictionary of Modern Dance (St. James Press, 1998); the American National Biography (OUP, 1998); The Village Voice; and the Movement Research Performance Journal. As a contributing editor to Dance Online he wrote reviews and co-wrote The Chronicles of Dancer X (1997?99), an online serial comic novel set in the Downtown New York dance scene. Caines has received grants from Meet the Composer, The Field, and the Astral Foundation, and in 2001 was a nominee for the CalArts Alpert Award. He is a 2006 Guggenheim Foundation Fellow in Choreography.